One of my favorites plushes in my collection! The first time saw one, I was all like "I need this" :| And so, I got one. I think Banpresto did a terrific job chibifying a Salamence, and I must commend them. He's huge, with movable wings, head, and tail! Sometimes I like to display him with his head upside down just to disturb people. Fun fact! He was sold as part of a set with Minun and Pikachu. All non-clear Salamence family kids ever made! Bagon is HUGE, lol. 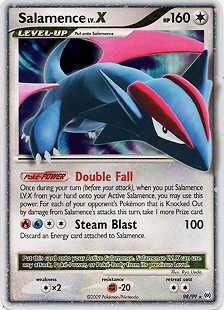 The dragon-clawing Salamence is probably one of my favorite kids of all time. He looks so determined! Rare, shiny, and epic! I've always loved how Lv.X pokemon appear to be "bursting" out of their frame. A sticker that was given away as a lottery prize at the Pokemon Center. It just so happened to be sold as a set with Milotic, which was very convenient for my particular collecting goals.